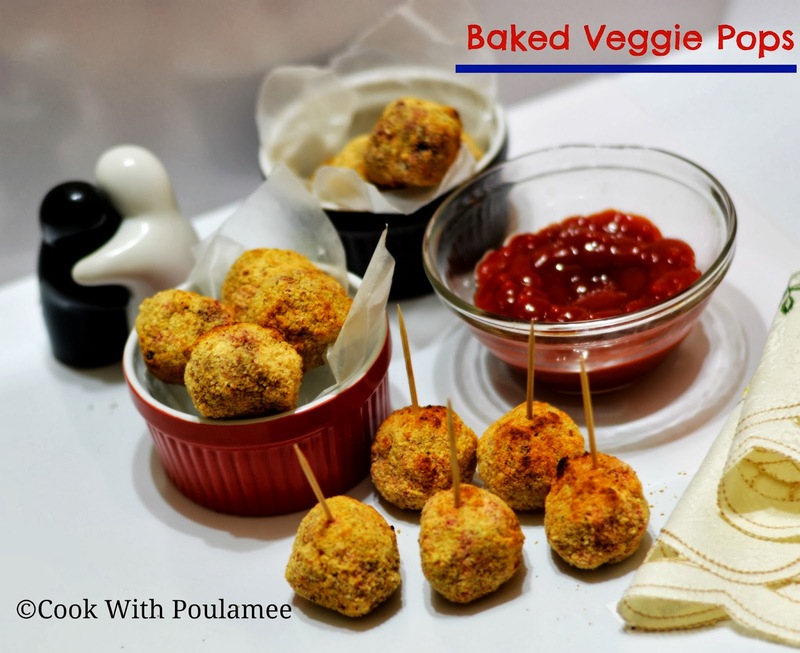 Cook With Poulamee: Baked Veggie Pops: A Guilt free snack. 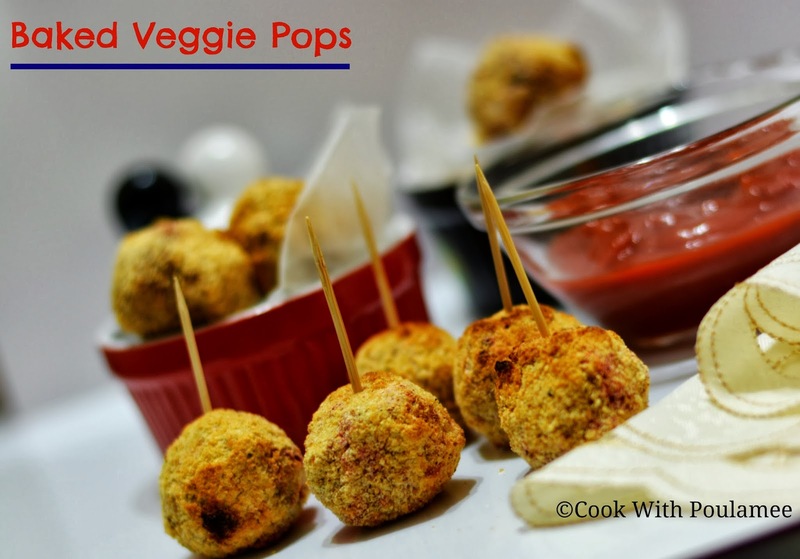 Baked Veggie Pops: A Guilt free snack. The most difficult part is to think what to cook every day, and than lunch and dinner the difficult part is evening snacks. My husband is very much fond of snacks, but fried snacks are not good for health. So I was really worried some time what to give him. Now my toddler girl also started eating the same food whatever we are eating with less oil and spices, like the chicken after cooking I wash her pieces with some hot water so all the masala gets washed out. So deep fried snacks are not good for her health also, that’s why I prepared some BAKED VEGGIE POPS for them which is completely oil free. After making it I was so happy because this type of snacks I can make for them every day. 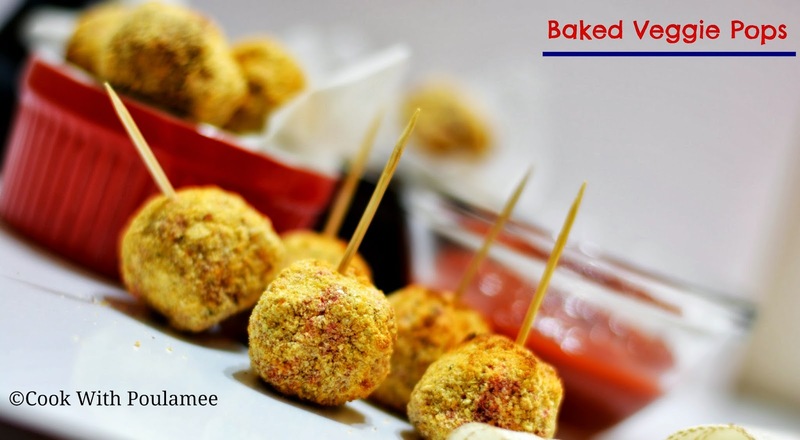 With some daily vegetable's only I prepared it, with tea this snack is always going to be a super hit dish in your home. I know all of you are actually don't love to eat deep fried snack for health purpose so this one can be the perfect choice. 1.One medium size potato: cut into small pieces. 2.One small carrot: cut into small pieces. 3.One small beetroot: cut into small pieces. 4.5 to 6 chopped beans. 5.Frozen peas: A hands full. 6.One medium finely chopped onion. 8.One table spoon lemon juice. 9.Chaat Masala: ½ tea spoon. 10.Aamchur powder: ½ tea spoon. 11.Black pepper powder: ½ tea spoon. 13.One to two table spoon oil. 14.Two table spoon all-purpose flour. Except peas semi boiled (like 50%) all the veggies in some salt water, and keep it aside. Now in a vessel add some oil and allow it to hot, now add the chopped onions and saute till it become golden. Now add all the veggies and frozen peas in to the vessel and cook for some time with a lid. Now remove the lid and add the lemon juice, salt, sugar, aamchur powder, chaat masala and mix well. Now semi smashed all the veggies (don’t smashed completely) with a spatula and allow it to cool. Add some water into the corn flour and keep it aside. Now make some small balls, first roll them into the flour, then dip them into the corn flour water mixture and finally roll them into the bread cramps and repeat the process 4 to 5 times with each and every balls so the outer part will be more strong. Now pre-heat the oven in high temperature in grill mode and baked the veggie balls for 15 mints or till each sides turn golden brown in between just shake the tray so that all the sides will bake properly. 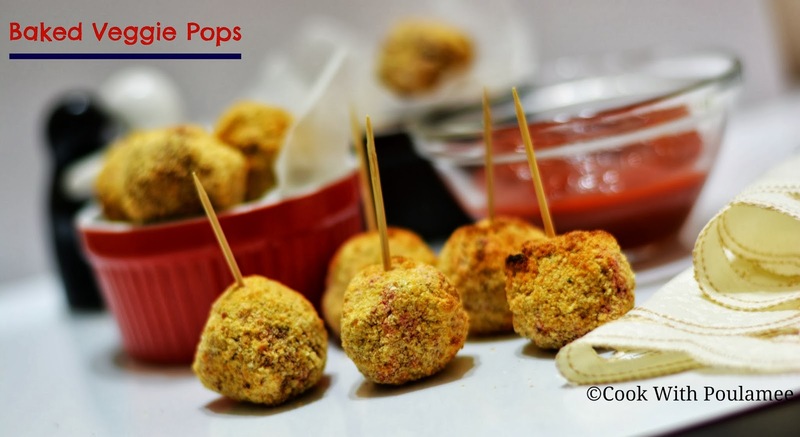 Now take out from the oven, your easy BAKED VEGGIE POPS is ready, serve hot with tomato ketchup.